IF YOU would like to experience the River Great Ouse in Bedford, the John Bunyan Boat Team have now published their cruise programme on the river for the 2018 season. The first monthly Jazz Cruise of the season sails from The Barns Hotel on Thursday 19th April. along with a Motown-Soul Cruise with DJ Keith Stewart on a monthly basis commencing on 10th May. The Afternoon Tea Cruise to The Barns Hotel commences on Wednesday 2nd May and runs throughout the season. The standard Sunday Afternoon Cruises sail from Priory Marina and Sovereigns Quay from 13th May with the Thursday Afternoon Cruise sailing from Sovereigns Quay from 14th June. 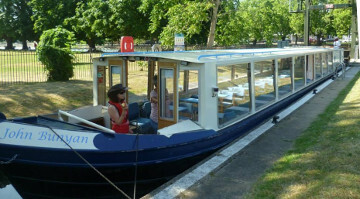 The Saturday afternoon Tea Cruises with the Bedford Swan Hotel run from the Swan Steps (at the bottom of Newnham Road) from 2nd June whilst the Saturday Evening Sunset Cruises with the Bedford Swan Hotel runs from 26th May. The Anchor Lunch Cruise to The Anchor Inn, Great Barford with return by coach sails from Priory Marina, the first one being 20th June at 10.00am. Another new cruise is 'Folk On The Boat' run in association with Mill Race Folk and will feature various folk music artistes. The first of these is on Thursday 14th June from The Barns Hotel.